This pork dinuguan recipe I have here is for those who loves to eat dinuguan but dislike eating the intestines and other innards mixed in the traditional pork dinuguan dish. It contains only pork belly, pork liver and of course pork blood. Cooking dinuguan is not as hard as you think. The only hard part is obtaining the pork blood which is not sold in supermarkets. You can only find it in wet markets and you have to be early on going to the market because it is usually sold out and also for you to be sure the pork blood is still fresh. To cook pork dinuguan; Cook the pork in approximately 3 cups of water for 30 minutes. Let it cool then slice the pork into cubes. Set aside the meat stock. In a wok or kawali, sauté the garlic and onion in oil for 5 minutes. Then add the pork, liver, patis, MSG and salt. Then pour in the vinegar and boil without stirring. Afterwards pour in the meat stock and simmer for 10 minutes. Add the pig’s blood and sugar and stir occasionally until the mixture thickens. Put the oregano and green chili then let it simmer again for 5 minutes. This pork dinuguan recipe I have here is for those who loves to eat dinuguan but dislike eating the intestines and other innards mixed in the traditional pork dinuguan dish. Cook the pork in approximately 3 cups of water for 30 minutes. Let it cool then slice the pork into cubes. Set aside the meat stock. In a wok or kawali, sauté the garlic and onion in oil for 5 minutes. Then add the pork, liver, patis, MSG and salt. Then pour in the vinegar and boil without stirring. Afterwards pour in the meat stock and simmer for 10 minutes. Add the pig's blood and sugar and stir occasionally until the mixture thickens. Put the oregano and green chili then let it simmer again for 5 minutes. I’m thankful for finding this pork dinuguan. I don’t like to eat dinuguan with pork innards so this one is what I’m looking for! Thanks again. Hi Maine, thanks also for your comment and good luck on your cooking! Hi Noel, I’m not sure if you can use black pudding because when cooking dinuguan, you need fresh pork blood. I’d never tried cooking dinuguan in Philippines and when I saw your recipe I find it simple. This recipe is perfect and I always prepare this for special occassions and during our dragon boat race. My team love it so much and they keep craving and requesting for me to cook again and again. Thank you so much for sharing this recipe. Hi Maria Maida, thanks for sharing your experience and I do hope that you will also try other recipes from this blog. I’m also happy that you like this simple recipe version of dinuguan. As Leonardo the Vinci said: “Simplicity is the ultimate sophistication”. Can i cook without the MSG? Is there a substitute? Hi JR, just omit the msg. just made this. true, very simple to make. only problem could not find pork liver. so substituted beef liver. to my surprise, my wife was very impressed. very surprised that i made it. she also enjoyed the beef liver. i was satisfied with the pork pieces. this recipe made it seem like there where the other intestine pieces. sad that i was not able to take pictures of finished product. definitely will make this many more times. 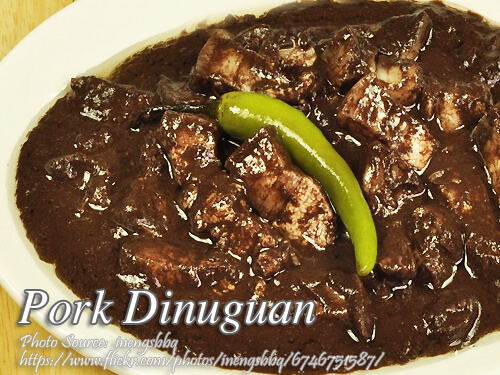 Hi Burnie, thanks for sharing your experience on cooking this dinuguan dish!